All Hallows’ Eve is creeping up on us. While prudent adults have conjured up appetizing ideas for healthy treats, I fear that these creative efforts will fall short of filling many a plastic pumpkin and … child with excitement. Nevertheless, such newfound intent to commit to healthier treats bodes well for the lifestyle choices of future generations. Pinterest is teeming with sugar free treats, and you’ll be pleasantly surprised at the ingenuity of some of the snacks that our health-conscious parents are preparing. 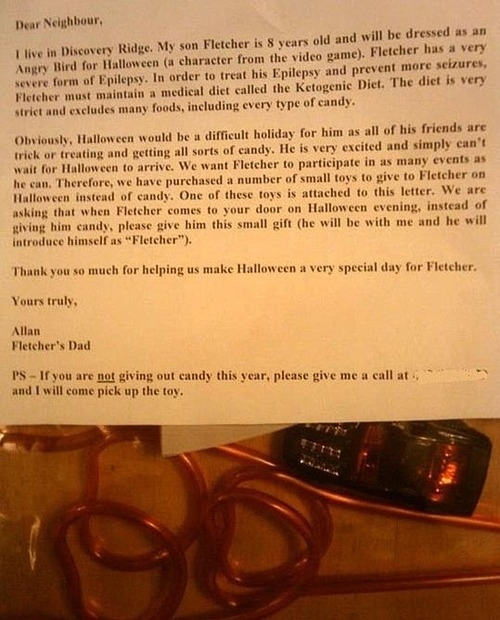 Of course, Halloween health concerns extend beyond merely consuming goodies. Costumes, contact lenses and trick-or-treating, all pose some safety risk. The important thing is that parents should think about the way their kids celebrate Halloween, anticipate undesirable consequences, and prepare accordingly. This dad did just that. « What is your risk?